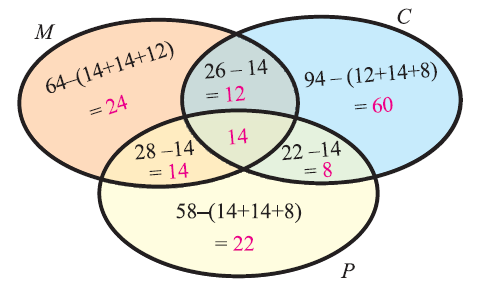 About the topic "Word problems on sets and venn diagrams"
Word problems on sets and venn diagrams is one of the topics in both school level math and quantitative aptitude. People who study quantitative aptitude to get prepared for competitive exams are stumbling to solve set theory word problems. The reason for their stumbling is, they do not know the basic stuff to solve set theory word problems. 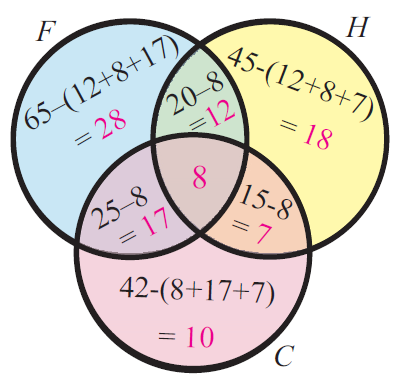 To understand, "How to solve word problems on sets and venn diagrams? ", we have to know the following basic stuff. Let us come to know about the following terms in details. n(AuB) = Total number of elements related to any of the two events A & B.
n(AuBuC) = Total number of elements related to any of the three events A, B & C.
n(A) = Total number of elements related to A.
n(B) = Total number of elements related to B.
n(C) = Total number of elements related to C.
n(A) - [n(AnB) + n(AnC) - n(AnBnC)] =Total number of elements related to A only. n(B) - [n(AnB) + n(BnC) - n(AnBnC)] =Total number of elements related to B only. n(C) - [n(BnC) + n(AnC) + n(AnBnC)] =Total number of elements related to C only. n(AnB) - n(AnBnC) = Total number of elements related to both (A & B) only. n(BnC) - n(AnBnC) = Total number of elements related to both (B & C) only. n(AnC) - n(AnBnC) = Total number of elements related to both (A & C) only. n(A) - n(AnB) = Total number of elements related to A only. n(B) - n(AnB) = Total number of elements related to B only. Let us consider the following example, to have better understanding of the above stuff explained using venn diagram. In a group of students, 65 play foot ball, 45 play hockey, 42 play cricket, 20 play foot ball and hockey, 25 play foot ball and cricket, 15 play hockey and cricket and 8 play all the three games. Let F, H and C represent the set of students who play foot ball, hockey and cricket respectively. From the venn diagram, we can have the following details. How to solve word problems on sets and venn diagrams? Let us go through the following example problems to know "How to solve word problems on sets and venn diagrams ?" In a survey of university students, 64 had taken mathematics course, 94 had taken chemistry course, 58 had taken physics course, 28 had taken mathematics and physics, 26 had taken mathematics and chemistry, 22 had taken chemistry and physics course, and 14 had taken all the three courses. Find how many had taken one course only. In a group of students, 65 play foot ball, 45 play hockey, 42 play cricket, 20 play foot ball and hockey, 25 play foot ball and cricket, 15 play hockey and cricket and 8 play all the three games. Find the total number of students in the group. Let M and S represent the set of students who like math and science respectively. At a certain conference of 100 people there are 29 Indian women and 23 Indian men. Out of these Indian people 4 are doctors and 24 are either men or doctors. There are no foreign doctors. Find the number of women doctors attending the conference. Let M and D represent the set of Indian men and Doctors respectively. So, out of the 4 Indian doctors, there are 3 men. And the remaining 1 is Indian women doctor. The word problems on sets and venn diagrams explained above will give clear idea to students on solving word problems on sets and venn diagrams. And also we hope that the word problems on sets and venn diagrams explained above would be much useful for the students who struggle to solve word problems on sets and venn diagrams.